When in Europe, do as the Europeans do, and spend your holidays relaxing on a picturesque beach. The continent is filled with some of the world’s most beautiful coastlines, stretching from the dramatic North Atlantic Ocean to the blue-green waters of the Mediterranean. Pack your favorite swimsuit, purchase a snorkel, and discover Europe’s best beaches! 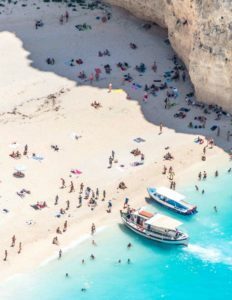 Navagio Beach on the Zakynthos Island is like no American beach you’ve ever visited before. Nestled in between a range of vast cliffs, the crescent beach is the perfect place to relax and take in the view. The area is known to locals as “Shipwreck Beach” due to the massive freighter that lays dormant on the sand. The cove is only accessible by boat, so prepare for an entire day of travel and adventure! Lampedusa is a small island located 100 miles off the southern coast of Italy, but it’s well worth the journey. The water on Rabbit Beach is shallow enough for visitors to wade out into the center of the bay, perfect for swimming and snorkeling. Take a short hike through the inland valleys, and cool off in the clear, calm waters of the Mediterranean. You may not want to go swimming at the Black Sand Beach in Vik, Iceland, but the experience is one-of-a-kind. Also known as Reynisfjara, the Icelandic beach is home to enormous basalt stacks and intriguing geologic features. The combination of vast rocks and dark sand creates a stunning landscape, and you’ll want to spend the day exploring this unforgettable place. If you’re an adventurer that prefers to spend their beach vacation away from tourist traps, Ölüdeniz Beach is the place for you. Translated to the “Blue Lagoon” the Turkish beach is surrounded by sparkling blue water and lush nature preserves. Relax on the beach, then try your hand at snorkeling, scuba diving, or paragliding! This entry was posted on Wednesday, August 1st, 2018	at 8:22 am	. You can follow any responses to this entry through the RSS 2.0	feed. Both comments and pings are currently closed.